If you are like me, and slightly allergic to bright hues, then you are always looking for colors that don’t deviate too far from the standard black and white spectrum. However, before you know it, grey becomes your best friend and wearing navy makes you feel like you are stepping completely out of your comfort zone (haha). With summer approaching, I’ve been personally hunting for a lighter hue to embrace, and recently stumbled across the oh so chic color option of egret- a color that falls beautifully between the spectrum of grey and white. Since then, my wardrobe has never been the same. From loafers to handbags, and an obi-belted dress that I’m finding it harder to resist every day, the muted hue feels like the perfect companion to black. Which leads us to today’s theme- an update on monochrome through accessories that are painted in egret hue. Isn’t the clutch a must-have? And who doesn’t love a pair of loafers that come at a such a low price? You’re welcome, my style mavens. You’re welcome. Lovely post, i like the shoes. They are so comfy too! I didn’t know this colour is called Egret up till reading this post! It’s such a pretty colour, and that pair of loafers is absolutely gorgeous! It’s the perfect color for mono mavens!! 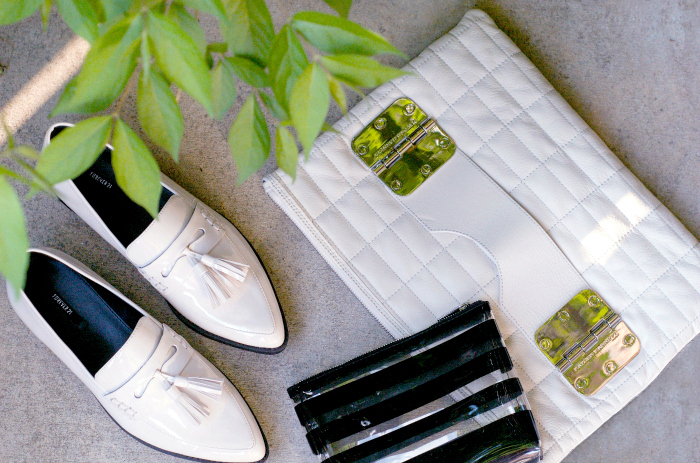 Cool white clutch & shoes! I saw those loafers in store and they really are amazing – F21 has stepped up their game this year, love to hunt down finds like this! I know! I had to buy them!